Welcome to the Beijing Haidian District Maps Menu at China Report.com / www.Drben.net. The Below Menu Page gives Quick and Easy Direct Access to Maps of Haidian District and Landmarks used in THE BEIJING REPORT, a part of ChinaReport.com. Haidian District lies outside of the Old City proper, and is in fact one of the largest and earliest suburbs of the former Imperial Capital, now the National Capital of Beijing. From a drab, sprawling and somewhat chaotic suburban and University District dotted with minor historical sites, Haidian has been transformed into something new. It is almost intangible but modernity has transformed the district. The addition of several subway lines has opened up access to the most remote corners such as the Yuanmingyuan - Old Summer Palace, the Yiheyuan - new Summer Palace Park, and even beyond into Mentougou District and the Western Hills. 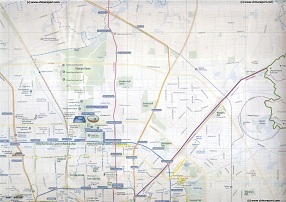 A guide map to the North-Western HaiDian District , a sprawling district under high development. Includes Summer Palace Museum, XinHua University, Beijing University and other institutes of higher learning, Beijing Zoo, Seaquarium, Five Pagoda Temple, Great Bell Temple etc. The official guide map to the world-renowned Beijing Zoo, featuring all animal accomodations and attractions of the new enlarged park (2005). 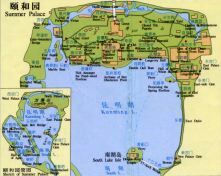 Yiheyuan - (new) Summer Palace Park - Site Map 01, includes Palace proper, plus (nearly) all Pavilions and Sites around Kunming Lake with Names. Overview the Entire Summer Palace - YiheYuan grounds and follow the Links where available to more Photos and Backgrounds on Structures and Sites of your Interests. Overview Map of the Yiheyuan Summer Palace Park, Yuanmingyuan, Yuquanshan, Fragrant Hills Park and Beijing Botanical Gardens in North-West Haidian District. 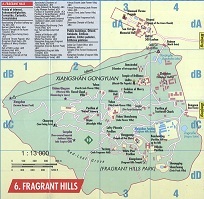 Beijing Fragrant Hills Park - Site Map, includes all Pavilions and Sites within Fragrant Hills Park of Beijing, located in the Western Hills of North-West Haidian District. Overview the Entire Fragrant Hills Park grounds and Link through to Photos and Backgrounds on Structures and Sites of your Interests. This Map depicts North ChaoYang District focusing on the 2008 Olympic Green (or Olympic Park) in the recently transformed North section of ChaoYang District. Included in the map are large parts of Haidian District in the West (Left), a small part of Changping District in the North, and minor parts of Dongcheng District and Xicheng District in the South. 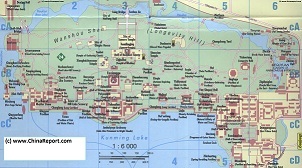 Browse the Map and follow the Links to more information and Photos! 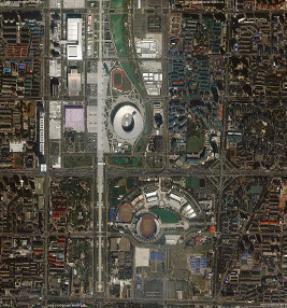 Satellite Image Map of Olympic Park / Ethnic Museum (2008). This Satellite Imaged Map dated to July 2008 gives an overview of the various structures of the Olympic Park of Beijing and the adjoining Ethnic Minorities Cultural Park (or museum) and wider area. The Olympic Park and Ethnic Museum are situated on the central axis of the ancient Imperial City and are located on the border of Haidian District and Chaoyang District in north suburban Beijing. This Map identifies all major structures of the Olympic Park including all Stadia and various service buildings. In addition, the assorted structures of the Ethnic Minorities Cultural Park as well as service points, subway stations and Hotels are highlighted where relevant and possible. Please browse the Map and follow the Links to more information and Photos!